We know that trying to find best Generac Authorized Sales & Service Dealer in Farmingdale, NJ can be one of the most challenging parts of the Generac generator installation process. Hopefully, you can stop searching now! 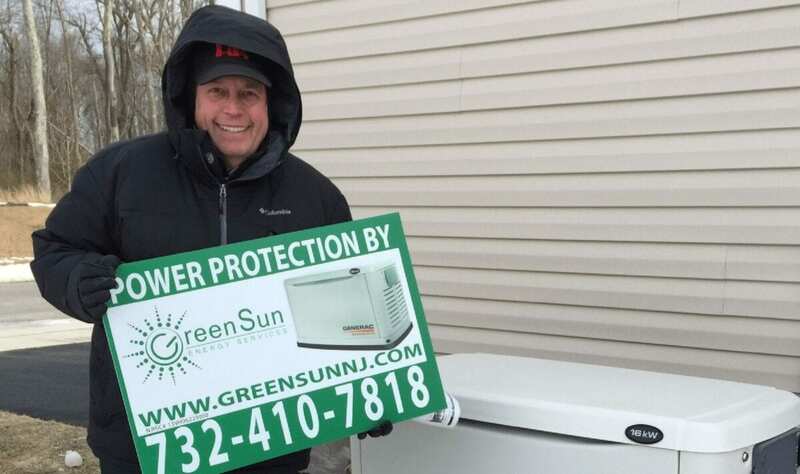 Locally owned and operated, Green Sun Energy Services is protecting Alex, along with hundreds of other homeowners from unexpected power outages. Together we can help find the right Generac home backup solution for you and your family. This project featured a Generac Model Number 6462, Generac 16 KW LP / 16 KW NG, 65 AMP Main Breaker, 200 AMP SR Service Rated Generac Smart Switch™ Load Center, Generac 6199/6186 Power Management Modules for the smart control of up to 2 Large Appliances and 2 4-Ton AC Units, 12 Volt Start Battery, Bisque Steel Enclosure W/Trim Kit, DiversiTech GenPad (54" x 31" x 3" 189 LBS), and Generac 5-Year Limited Warranty. This package also includes MobileLink™ for remote monitoring and a PSP service entrance rated whole house surge protector; 160,000 surge Amp capacity; lifetime replacement warranty (parts only) and $25,000 (limited) coverage for household appliances damaged by a surge. After you've passed your Farmingdale township inspections, we'll make sure that you generator is ready to do its job when the power goes out.